I see before me towering waves and the endless expanse of the ocean. And though I am in the midst of this turbulent sea, I am not overcome. It’s His majesty on display and something within my spirit is waking up. In this encounter, the surging of the seas and the mighty force of the waves begin to displace any natural fear, for in every wave there was greater might, greater strength, greater majesty and greater glory. 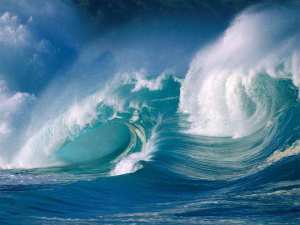 One after the other, the waves rose higher and higher, each one bigger and stronger than the one before. Just as the cherubim cry “Holy, Holy, Holy is the Lord” for all eternity, so my spirit wanted to cry out as each wave rose higher and higher. My heart began to burst with joy at the sheer majesty and power of the waters. His glory no one can fathom. His might is more powerful than we dare imagine, for if we knew the strength of His power, we would be undone. Yet…my heart rejoiced. My soul responded to His glory and my hands lifted high in praise for what I beheld. I began to cry out the holiness and majesty of His name. As I lifted my hands to Him, I rose higher and higher into the heavens. It was as if my praises were raising me up to the heavens! I was being raised up with Him, to where He is seated in heavenly places. I now saw the earth below me and knew stillness and peace. There was no fear. No doubt. In the midst of being suspended above the wide expanse of His creation, there was only JOY and delight. The certainty of His Person, His Presence, and His Power was absolute. The freedom of my soul was other-worldly. In this reality, I knew – He is the One who created it all. He is the One who has determined all things for all times. The power of His majesty is about to be revealed. My recognition of His majesty and declaration of His holiness is what lifted me up! The power of my praises raised me to heights I had never been, encounters I had never known. All of creation is stirring up His glory and His majesty for He cannot hold back much longer. Its power is fueled by His eternal RIGHT and authority to REIGN and RULE over every living thing. The King of Glory will come in to take His rightful place – that place that was always His alone – and every other foe will be destroyed.